The situation in Syria and the lack of concerted international effort at the level of the UN Security Council (UNSC) and the International Criminal Court (ICC) to bring perpetrators to justice - more than two years on - supports claims that the international justice mechanism targets African heads of state. The UN's human rights chief, Navi Pillay, directly implicated Bashar al-Assad for serious crimes of international concern in Syria. She said a commission of inquiry has produced evidence of war crimes and crimes against humanity authorized in Syria at "the highest level". It is not the first time a top UN official links president Assad to atrocities in Syria. 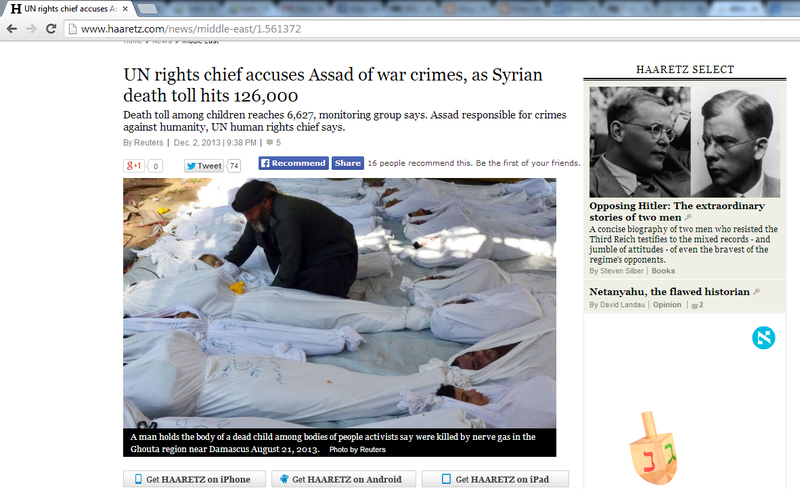 In September 2013 UN Secretary General Ban Ki-moon openly accused Assad of committing crimes against humanity. The ICC was established as a permanent institution with power to exercise its jurisdiction over persons for "the most serious crimes of international concern" - as stated in article 1 of the Rome Statute. The court has been accused of "hunting Africans" while ignoring crimes of international concern elsewhere. According to a timeline of the unrest in Syria, the conflict started in March 2011 when Syrian protesters demanded the release of political prisoners. More than two years later, the conflict rages on with no sign of justice for numerous victims of heinous crimes, including the use of chemical weapons against civilians. Thousands of people have lost their lives. According to information published by Reuters, the conflict has claimed at least 125,835 lives, more than a third of whom are civilians. The Syrian Observatory for Human Rights (SOHR) points out that the real figure is probably higher. The UN reported in July 2013 that more than 100,000 have been killed in the conflict and 1.7 million Syrians forced to seek refuge in neighboring countries. A more recent report shows that 2.2 million Syrians have fled the country and children have been most affected. In my assessment, if president Bashar al-Assad of Syria were head of state of an African country, the international community's response to the conflict would have been different. The tone of the UNSC would have been more robust and the situation would have long been referred to the ICC. It is therefore my opinion that the conflict in Syria is so far a lost opportunity for the international community to show that the ICC is not designed to hunt African leaders who are "disloyal" to the West and somehow stand in the way of western interests. Sudan and Libya were not parties to the Rome Statute when the UN Security Council referred situations in the two African countries to the ICC in 2005 and 2011 respectively. Acting under Chapter VII of the UN Charter, the Security Council can refer Syria to the ICC irrespective of whether or not the country is a Party to the Statute. Failure to bring Assad to international justice will, in my opinion, undermine the credibility of the international justice mechanism. Although I share the view that the ICC has so far focused on cases in Africa, I support the work of the court in the fight against impunity in the region. I would however like to see the court investigate and prosecute crimes of international concern in other part of the world. Selective justice is no justice.